We are killing the imaginations of our young. 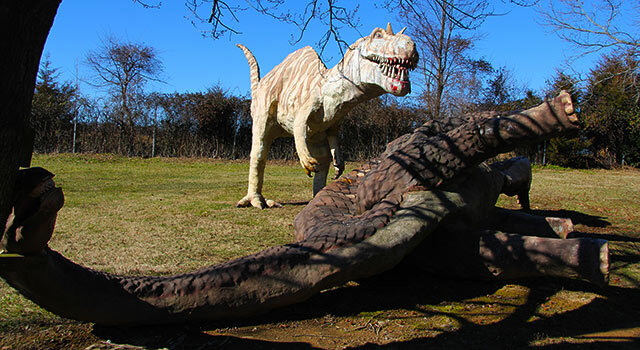 Photo from Dinosaur Land website. I started thinking about this recently while traveling on Virginia Route 522 from Winchester to Front Royal, because in the van to my left, a Disney movie was playing on a screen that hung down for the kids in the back seat. Adding to my irritation was the fact that we were within half a mile of Dinosaur Land, one of those old-fashioned roadside attractions that were everywhere fifty years ago. In fact, Dinosaur Land opened fifty years ago and just getting a glimpse of those giant, plaster T-Rexes and their friends would have held my imagination for another 100 miles. Fifty years ago, in the days before DVD screens, or for that matter, power windows, headrests, air-conditioning, or seat belts, you had to entertain yourself as you cruised along on family vacation or anywhere else you were going. And you were not likely to be cruising on the Interstate because it had only been started 10 years before and was largely incomplete. In those days, if you drove past an abandoned house, that was automatically a haunted house, and you populated it according to your own imaginative taste. You read the billboards, watched the attendants wash car windshields at the Esso station, and noticed that the town you were now passing through looked a bit different from your own town. I am convinced that my sense of observation and imagination was developed because it was encouraged by Mom and Dad–and by necessity–and not anesthetized by electronics that could only be . . . well, that could only be imagined back then. Sorry. That last bit was just my imagination running away with me, but the point is this: If we want future inventors or bloggers or Temptations, we need to encourage our children to develop their imaginations, and not just passively consume what others have imagined for them. This entry was posted in Life is Interesting, Uncategorized and tagged developing imagination in children, Dinosaur Land VA, Kohl's, using your imagination. Bookmark the permalink. I completely agree! We often talk about how, when our children were younger, it was a treat to be able to share the sights as we drove down the highway to ANYWHERE! We made up games, we had them help watch for landmarks, all kinds of things! They learned! The gained some actual working knowledge of the world around them that they will use for the rest of their lives. They also broadened their imaginations, their acceptance, and their global perspectives! Turn off those electronics, folks!! Let your kids ENJOY their surroundings! Well said, George, and thanks for commenting. I still enjoy being the passenger and I still see old barns and fences, etc. that I had never seen before. Thanks, and your replay of Boots’ games is a really cool idea. I checked out the games from August 14th and 21st. Would you please provide the link for your first post in the series? Thanks also for your kind words regarding Boots Poffenberger: Hurler, Hero, Hell-Raiser. He was indeed a fascinating guy who played during a fascinating time. I would love to encourage my children to use their imaginations, but how do you do that when they are on all of their electronic devices almost 24/7? It’s not easy in today’s world, Don. I even find myself checking my phone constantly. All I can say is that I’m glad I grew up when I did!